A 25-year-old Ukrainian man has appeared in court charged with the "terrorist-related" murder of 82-year-old Mohammed Saleem in Birmingham. West Midlands Police said that Pavlo Lapshyn has also been charged in relation to explosions at three mosques. Mohammed Saleem was stabbed as he walked home after prayers from a mosque in Small Heath on 29 April. Mr Lapshyn was remanded in custody to appear at the Old Bailey on Thursday. Mr Lapshyn, who comes from the eastern Ukrainian city of Dnipropetrovsk, appeared in the dock at Westminster Magistrates' Court flanked by three police officers. He was dressed in black and only spoke to confirm his name and date of birth as 12 March 1988. West Midlands Police charged the postgraduate student with murder on Monday evening. Mr Saleem was stabbed a matter of days after Mr Lapshyn began a work placement in the UK. In a statement on Monday morning, police confirmed Mr Lapshyn had also been charged in relation to incidents at mosques in Walsall, Tipton and Wolverhampton. The court heard that Mr Lapshyn was accused of causing explosions on 21 June and 12 July, contrary to Section 2 of the Explosive Substances Act 1883. Mr Lapshyn is further charged under Section 5 of the Terrorism Act 2006 with intending to commit acts of terrorism between 24 April and 18 July. It is alleged that he bought batteries, a lunch bag, clock and green container as part of the construction an explosive device. It is further alleged that he carried out internet research to identify locations to plant explosive devices and that he visited at least one area in the West Midlands as part of that planning. He is further accused of buying chemicals online to make an explosive device and of modifying mobile phones to be used as detonators. Detectives from West Midlands Police have flown to Ukraine to continue their investigations into Mr Lapshyn. The student came to the UK for a work placement with Delcam, a company that specialises in software for manufacturing industry. Mr Lapshyn was awarded the work placement as part of a project in which international students get the chance to work temporarily at the company. In 2012, he attended a ceremony at the Kiev residence of the UK's then ambassador, Leigh Turner, in which top students from the National Metallurgical Academy of Ukraine received prizes as part of the scheme. Mr Lapshyn is a PhD student at the academy and, according to his teacher and research advisor, Viktor Laskin, is one of the academy's top students. 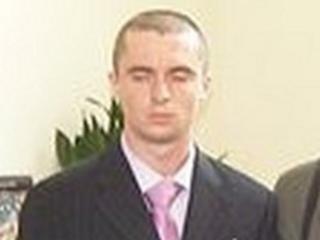 Mr Laskin told the BBC Ukrainian correspondent Vitaliy Chervonenko that Mr Lapshyn was also deeply interested in computers and technology. Some Muslim organisations have claimed that the political and police response to the mosque attacks in the West Midlands had been "too little too late", the BBC's Home Affairs correspondent Matt Prodger said. In response, a Home Office spokesperson said the government was treating recent incidents in the West Midlands "extremely seriously". "Officials in the Home Office have been in regular contact with West Midlands police and local Muslim leaders to provide support," said the spokesperson. "The home secretary has spoken personally with Assistant Chief Constable Marcus Beale and asked to be kept up-to-date with the latest developments. "The Security Minister James Brokenshire is also visiting Birmingham today to meet those who have been directly affected."